the winning entry has been selected for the competition ?inventing bruneseau,? organized by the city of paris and the SEMAPA. the proposal was developed by a team of architecture practices, including sir david adjaye?s firm, adjaye associates. known as the ?nouvel R,? 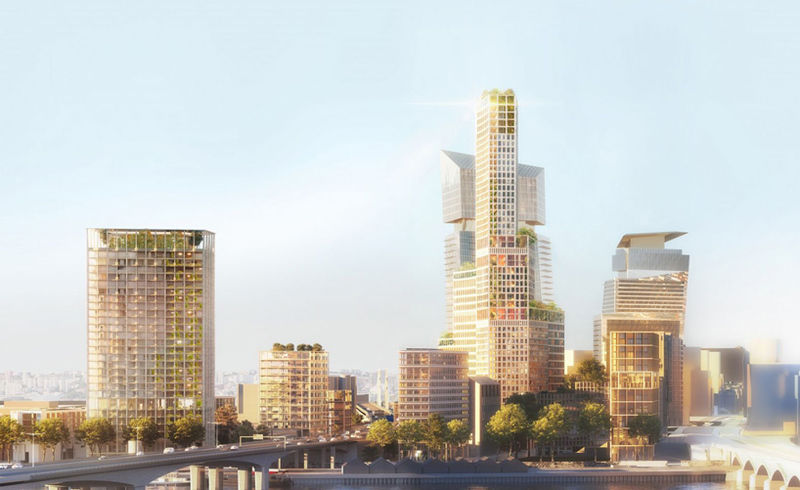 the ambitious project aims to create a connection between paris and ivry sur seine, transforming bruneseau into the first de-carbonized district of france. the new urban center aspires to be concurrently intense and relaxed, generating an uninterrupted urban continuity between paris and ivry sur seine. with ?human beings at the heart of the project,? the bruneseau district will introduce freely accessible, open-program space for multicultural urban expression. around the kagan district with start-ups, art galleries, maker spaces, the paris-ivry drive will breathe new life into the area, designed around the model of the boulevards in the center of paris. the proposal was developed with consultation by architecture firms hardel le bihan, youssef tohmé architects, adjaye associates and buzzo spinelli architecture.